James Milton Rhodes Acorn, born on March 30, 1923, in Charlottetown, Prince Edward Island, was an award winning poet and social justice activist. At the age of 18, Acorn enlisted in the army. However, his service was short-lived; he was discharged for an injury that inflicted inner ear damage and hearing loss as a result of a blast onboard the troopship carrying him to Europe. After his discharge, Acorn found employment in different areas, briefly doing clerical work in Moncton, and also working as a carpenter on PEI. In 1950, Acorn turned his attention solely to poetry; he sold his carpentry tools and moved to Montreal in 1951. In 1956, while in Montreal, Milton Acorn published his first collection, In Love and Anger. From then on Acorn produced an array of poetry in Toronto, Vancouver, Montreal and Charlottetown at different points in his life. In 1969, his collection I’ve Tasted My Blood was published, and though this work was widely acclaimed within the Canadian poetry community, it was overlooked for the 1970 Governor General’s Award. 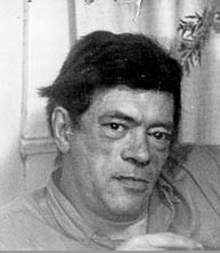 In response to his being overlooked, Acorn was honoured by his peers as the recipient of the Canadian Poet’s Award in 1970, which lead to his title as the “People’s Poet”. Acorn later won the Governor General’s Award in 1976 for his collection The Island Means Minago. In 1977, Acorn received an Honorary Doctorate from the University of Prince Edward Island. Milton Acorn’s poetry frequently focuses on social injustices, motivating the readership to stand up and fight against inequality. Using strong diction and imagery that stirs the reader’s emotions, Acorn inspires activism. In his hometown of Charlottetown on August 20, 1986, Milton Acorn died of a heart condition. Poem: "Knowing I Live in a Dark Age"
calling a shabby poet back for his change. this and like things followed. as a poem erases and rewrites its poet. Published in Jawbreakers. Contact Press, 1963. Published with permission of Mr. Acorn's Literary Executor and Publisher. Milton Acorn’s “Knowing I Live in a Dark Age” is a call to arms in order to create a future that benefits all human life, and not just those with economic and social privilege. calling a shabby poet back for his change (2-5). The honourable action of the newspaper seller provides the reader with a sense of hope, as it demonstrates solidarity amongst the downtrodden despite the culture of individualism created by capitalism. Victory for the working class will come, and a new history will begin. this and like things followed (10-13). Acorn depicts Jesus as the founder of social consciousness and collectivism. Jesus’s ultimate sacrifice was altruistic - done not for personal gain, but for the good of humankind. This is when history truly begins. The speaker holds that capitalist greed has been destructive to the socialist teachings of Christ, creating a prehistoric society in which the elite prey on the economically disadvantaged working class. The speaker depicts our current economic system as unstable and prone to inflicting In saying that he lives in an “advertising rainbow,” the speaker compares his way of life to an optical illusion (14). Thus, Acorn suggests that the illusion produced by consumer capitalism distorts our perception of reality. The working class cannot help but live like “trapeze artist[s] with a headache,” as the slightest slip could result in falling into the depths of poverty, and there is no safety net (15). As a poem erases and rewrites its poet (22-24). The victory of the working class will follow this poem, which depicts a dark age of inequality and individualism. The working class has not succeeded in ending the dark reign of the capitalist regime, but the speaker asserts that it will happen. Acorn, Milton. “Knowing I Live In A Dark Age”. Jawbreakers. Toronto: Contact Press, 1963. 54. Print. Acorn, Milton. Against a league of liars. Toronto: Hawkshead Press, 1960. Print. ---. The Brain's the Target. Toronto: Ryerson Press, 1960. Print. ---. Captain Neal MacDougal & the Naked Goddess: A Demi-prophetic Work as a Sonnet-series. Charlottetown: Ragweed Press, 1982. Print. ---. Dig Up my Heart: Selected Poems 1952-83. Toronto: McLelland and Stewart, 1983. Print. ---. Hundred Proof Earth. Toronto: Aya Press, 1988. Print. ---. I Shout Love and Other Poems. Toronto: Aya Press, 1987. Print. ---. I Shout Love; On Shaving Off his Beard. Toronto: Village Book Store Press, 1971. Print. ---. The Island Means Minago. Toronto: NC Press, 1975. Print. ---. I've Tasted my Blood: Poems 1956 to 1968. Selected by Al Purdy. Toronto: Ryerson Press, 1969. Print. ---. Jackpine Sonnets. Toronto: Steel Rail Educational Pub., 1977. Print. ---. Jawbreakers. Toronto: Contact Press, 1963. Print. ---. More Poems for People. Toronto: NC Press, 1972. Print. ---. The Northern Red Oak: Poems for and about Milton Acorn. Toronto: Unfinished Monument Press, 1987. Print. ---. A Stand of Jackpine: Two Dozen Canadian Sonnets. Toronto: Unfinished Monument Press, 1987. Print. ---. To Hear the Faint Bells. Hamilton: Hamilton Haiku Press, 1996. Print. ---. The Uncollected Acorn. Toronto: Deneau, 1987. Print. ---. Whiskey Jack. Toronto: HMS Press, 1986. Print. Acorn, Milton. The Edge of Home: Milton Acorn from the Island. Ed. Anne Compton. Charlottetown: Island Studies Press, Institute of Island Studies, 2002. Print. Deahl, James. "Living in a Dark Age: Milton Acorn and Modernism." Dalhousie Review. 94.2 (2014): 274. Print. Doyle, James. “‘For My Own Damn Satisfaction’: the Communist Poetry of Milton Acorn." Canadian Poetry. (1997): 74-87. Print. Gibbs, Robert. "Whiskey Jack." Journal of Canadian Poetry. 3 (1988): 1-3. Print. Goldie, Terry. "Milton Acorn: in Love and Anger." University of Toronto Quarterly. 70.1 (2000). Print. Jewinski, Ed, and John Thurston. "Milton Acorn & His Works." Journal of Canadian Poetry. (1992): 177-87. Print. Lemm, Richard. "Milton Acorn: Poet in a Dark Age." Arts Atlantic. 7.3 (1988): 50-51. Print. Lemm, Richard. Milton Acorn: In Love and Anger. Ottawa: Carleton University Press, 1999. Print. O'Grady, Thomas. "Advice from Milton Acorn." Canadian Literature. 97.155 (1997). Print. O'Grady, Thomas. "(Ap)praising Milton Acorn." Canadian Literature. 98.158 (1998). Print. Pearce, Jon. "The Idea of a Poem: an Interview with Milton Acorn." Canadian Poetry: Studies, Documents, Reviews. 21 (1987): 93-102. Print. Richards, David A. "Milton Acorn." Antigonish Review. 2012.171, (2012). Print. Singleton, M. "Milton Acorn: the Last Days." Antigonish Review. (1988): 64. Print.